Nabin Chandra Das has always been associated with production of sugar. He started his business at a very tender age. He suffered many losses in business. And then he opened a sweetmeat shop in 1866 at Baghbazaar in North Calcutta and very soon he realized that he had opted for the right thing. Nabin Chandra Das discovered that 'Sandesh', though very tasty, was getting stuck in the throats of many owing to its dryness. Then he thought of soaking it in sugar syrup, and named it as ‘Rosogulla’. It was loved by all. He was the one to create ‘Baikuntha Bhog’ which was relished by all. 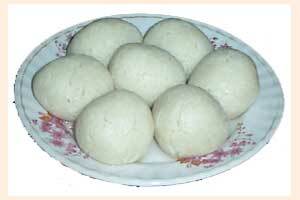 The sandesh that he prepared used to be ungranulated and properly boiled. So it is devoid of the excess fluid, dry and very palatable. Some more of his outstanding creations are 'Ratabi Sandesh', 'Abar Khabo' etc.